On a brighter note, I finally made it along to Newcastle Gamers for the first time since October. It was also my first visit with unclaimed Zombology stock, so I tweeted about bringing it and mentioned it on the Meetup page too. After a quick game of Keltis das Kartenspiel with Olly, John S and Neil, I asked around if anyone was interested and managed to drum up six people who were. We played a game, and then Trevor requested a second game. Afterwards I made my (pretty weak!) sales pitch: 'I've made these myself. I've got a quarterly mailing list if you'd like to subscribe, or you can buy a copy if you like for £10. If you don't want to do either of those that's fine.' I took four mailing list subscriptions and sold three copies! Which considering two of the six were a couple means a 60% conversion rate - I'm happy with that! Afterwards we play a couple of games of Codenames, which was great fun too - I'd only played the Pictures version before, so it was nice to see the original version. It was great to make it to Newcastle Gamers, I rarely make it because of kid-related exhaustion, visitors or visiting friends and family or work travel. This week is going to be very busy. By Wednesday I need to do my tax return and I'm hoping to submit FlickFleet to the Cardboard Edison Award. I've never submitted a game to a competition before, so it'll be interesting to see how that goes. I've got a really good feeling about FlickFleet (the feedback has been very positive) so hopefully we'll either do well or get some good feedback from the judges. I've been working on the rulebook in preparation, so that's starting to take shape a bit more, with pictures and scenarios included now. On the weekend my friend Paul (my FlickFleet co-designer) and his family are coming to visit, so I'm hoping to get the next version of FlickFleet prototypes made in time for that (at least his copy!). 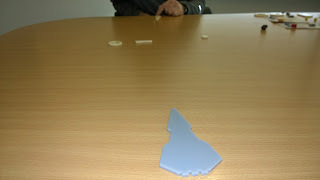 I've made some changes to the rules and some minor changes to the laser-cut pieces. I've also significantly changed the ship dashboard cards and the wooden piece requirements. I'm getting five copies made, a refresh of mine, one for Paul (hence the rush! ), a couple of playtest copies and one that will either go to Cardboard Edison if we make the first cut or another playtest copy. I meant to do these ages ago, but my printer broke and then the Perspex I need for the laser-cutting was delivered to London in error, so they've had to send me another copy that will hopefully arrive today. Assuming they get here in time I'll drop them off with Dan for laser-cutting on Wednesday and then hopefully assemble the rest early next week. I've still not managed to fix the printer, so I might need to go to some professionals for the prototype printing, which will probably end up being surprisingly expensive, despite the fact that I only need 12 sheets of card printed and I can provide the card. If you follow me on twitter you've probably spotted my #CraftWednesday activity on, unsurprisingly, Wednesdays. I started it towards the end of last year and I'm pleased to say that it's been reasonably successful with a decent number of people getting involved, quite a few of them from week to week. What is #CraftWednesday I hear you ask? Every Wednesday I post a series of tweets about cool board game-related crafting activities that I've seen during the previous week and then check in with the people who have previously got involved to see how they are getting on. I've chosen crafting as the topic as it's something close to my heart. One of the reasons I started a second board game publishing company is because I missed the hand-crafting days of the beginning of Reiver Games - I love doing the graphic design, and hand-crafting the physical games. I also enjoy doing the art, though not as much (and I'm worse at that bit!). I am by nature a maker of things. Since as far back as I can remember I've preferred making things in my spare time to consuming them (it's been variously designing roleplaying missions and scenery, painting miniatures, writing bits of computer games, making mobile apps and for a long time designing, doing the graphic design and then hand-crafting board and card games, both prototypes and for sale). I love the creativity, keeping busy and focused and finally the pride you feel looking at what you've accomplished. I strongly believe that a board game (which have been my passion for at least thirteen or fourteen years, and if you include tabletop roleplaying and CCGs then it's nearer to 25) isn't a game if it's sat in a box on someone's shelf (whether yours or the customer's) - it's just a collection of pieces. Games are only really games when they are being played, so obviously I want the games I designed to get played. There's a couple of traditional routes to this: approach a professional publisher or Kickstart it yourself. Which are both fine, but approaching a publisher means that the design and graphic design is done by someone else and the crafting is done by a factory. Kickstarter lets you take control, but I don't think I've got the chops or the marketing skills to do a large run successfully through Kickstarter, I'm a little uncomfortable with the Kickstarter model, plus around my young family and busy job I don't want the hassle of trying to sell off the remaining stock to shops and distributors or organise and pay for the warehousing of it. I've done that before and I know how much work is involved. So, here I am happily hand-crafting small print runs, desperately hoping that I'm good enough at marketing (and the games are popular enough) for me to sell out of the 200 copies of Zombology that I have in flight. But #CraftWednesday is not about me, it's about the rest of the community of gaming-related crafters. It's about sharing the cool stuff that people are making, whether it's for sale, as a gift to a friend or a stranger or as a personal project to enhance the gaming experience in your own house. It's pretty broad, covering everything from hand-made dice trays, through laser-cut dice towers, scribbled prototypes, hand-sewn game pouches and bags and 3D printed game pieces or scenery. It's about celebrating the great stuff that people are making and sharing all that creativity more widely. It's about reaching out to those members of the community who share my love of making things and sharing their projects, achievements and successes with a wider audience. It's also about encouraging that effort. On a recent training course I heard that research has found that setting yourself a goal is great but by itself it is not enough. You are significantly more likely to achieve it if you: write it down, come up with a plan, commit to a supportive friend to doing it and provide regular updates to that friend. Doing each of those things increased the chance of success, doing them all was the most successful option. I've taken that research to heart and I've set up a Board of Advisers for Eurydice Games to help keep me accountable. I realised though that I could give that back. By spending a chunk of my time on a weekly basis checking in with people on their crafting projects I could help them be successful. Last week in the US was a partial success from a Eurydice Games point of view. I arrived on Monday afternoon and after being up since 10pm the night before (US time) went to the office, to an early dinner and then to bed (at 6:30pm!). Which was just as well, since I was up at 1:30am on Tuesday to do a podcast Interview with Jack Eddy from The Cardboard Herald at 2am (which was 10pm for him in Alaska!). It was a great chat that lasted over an hour and Jack tells me it will be available in a few weeks. Hopefully the jet lag, lack of sleep and early start don't make me sound too stupid! I had hoped to find a Games group that I could join on Wednesday night, but despite asking on twitter, Google+, BGG and Meetup I was unable to find a group in time. I awoke at 4:30 (I don't travel well!) on Thursday, my last day in Massachusetts to a message from Chip Beauvais (designer of Universal Rule) telling me about a group that would have been perfect for the previous evening :-/ I'll definitely join them on my next trip to Massachusetts (I get there three or four times a year). Thursday I flew down to Raleigh/Durham for further work meetings on Friday. But I had Thursday evening free. This was fortuitous since I had thought that W. Eric Martin (editor of BGG News) lived in Massachusetts so I'd looked him up on BGG only to find he lives near Raleigh! I'd met Eric a few times during my Reiver Games days and was keen to show him Zombology and get his feedback on my FlickFleet prototype. He's started a series of short video interviews of board game creatives too, so I agreed to another interview and we were both happy. It was a great evening. Eric turned up with his very professional looking video equipment and then after a short video interview we chatted about Zombology and played a couple of games of FlickFleet. Eric also had some great ideas about FlickFleet too. I got back on Saturday morning, and this afternoon I'm off again to Manchester this time for an early meeting tomorrow. I'm going to swing by Tabletop Manchester and hopefully get to play Zombology with a few people and maybe even get a few sales - I'll also be taking FlickFleet too. I need to play more games of Zombology with people - it's going to be critical to helping me hit my targets and sell the games, which I need to do to fund the publishing of FlickFleet later. I'm travelling to near Boston, MA for work this week as I do a few times a year. This time I've arranged a couple of things Eurydice Games-related to do in my spare time during my trip. As usual I'll probably be awake from very early in the morning (jet-lag is not my friend) so I'll have some time to spend doing some work on the website and the FlickFleet rules too. 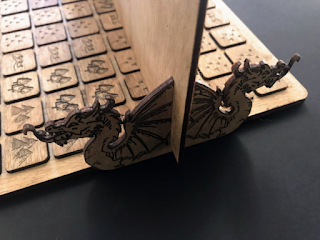 This month I need to get a few new FlickFleet prototypes made: updating mine, one for my co-designer Paul, plus one for Todd (who won my NaGa DeMon competition back in November) and a couple for far flung playtesters. 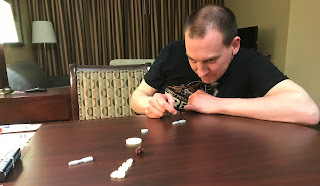 I need to re-write the rules to reflect the changes Paul and I made just before Christmas and order more perspex, dice & wooden tokens and get some greyboard to make the boxes - all of which I can do in the early hours from my hotel room in America. When I get back I'll have to get the laser-cutting done, print the new ship cards (hampered by the fact that my printer is now broken) and assemble the prototypes ready for shipping. I also want to make some improvements to the website (I need to add a page linking to the Zombology reviews and BGG, plus add a few more customer testimonials) and I need to pay the charities the money I pledged as part of my Charity December promotion. But the most exciting part of the trip is a couple of interviews I'm doing. Tuesday morning I'm being interviewed by Jack Eddy of The Cardboard Herald (it's much easier when I'm on US Eastern time than when I'm at home seeing as he's in Alaska, nine hours behind GMT!) and then on Thursday I'm meeting up with W. Eric Martin, the editor of BoardGameGeek News. I met him a couple of times while I was running Reiver Games, at the UK Games Expo and again at Essen, but I last met him in the flesh about 8 years ago. Eric lives fairly close to our office in North Carolina, so while I'm down there on Thursday and Friday I'm going to meet up with him to show him Zombology and my FlickFleet prototype (with old ship cards - stupid broken printer!) and do a video interview too. Hopefully both of these efforts will help raise the profile of me and Eurydice Games and might even lead to a couple of sales further down the line. For now though I need to go and catch a flight! Happy New Year everyone! I wish you all a happy, healthy and successful 2018! 2017 was a momentous year for me. Not only was my second daughter born during it, but I also started my second board game publishing company making hand-crafted board and card games. Question: What kind of idiot starts a company months after the birth of their child, when they already know how much work is involved in starting a company, hand-crafting games and raising a baby? Answer: My kind of idiot. It's been hard work (as I knew it would be), but it's been rewarding on both fronts. Daughter the Second is now mostly sitting up, eating real food and still sleeping like a baby (i.e. badly). Eurydice Games is off to a great start: Zombology has got some great reviews on BGG, a decent average score and I've sold nearly a quarter of the print run and made a third. I've also got another game that's coming on really well too in FlickFleet. Unlike last time round I've got a Business Plan, and according to that things aren't quite on track - I hit my 2017 sales target but I didn't get all the games I wanted to make in December made (it was a busy month with some work travel, work meetings and evening events, Christmas holidays and some particularly poor sleep from the baby, so I had few evenings available for crafting and I was often too knackered on those evenings to do it. I think I'll reduce my construction targets in 2018, I'm still aiming to make all the games within a year of the launch of Zombology in September 2017 though. One of the things that has changed since I ran my first company is Kickstarter, and it has democratised the publication of board games, allowing every person and their dog to publish a game - so the marketplace is a lot more crowded. It's no longer possible to have a fairly basic website and shout at the internet via twitter and Google+ and expect your games to sell out. I need to do things differently. There's a bunch of people out there who really like Zombology, and a bunch more who will love it if they come across it, but with all the Kickstarter noise that's pretty unlikely. The most successful route to sales that I've had so far has been actually playing it with people - I need to ensure that I'm introducing new people to Zombology every month and hopefully that'll allow me to keep hitting my targets. I'm also hoping to step up my media efforts (a forthcoming trip to the US is going to feature a podcast segment and a video interview). I need to get to conventions and games clubs and introduce people to it on a much wider scale - there's a goal for 2018!